My name is Gavin Rawlings. I am the co-founder, director of photography and editor at Venture Films in Australia. I entered the industry professionally in 2008 after attending film school and I have been using ShotPut Pro since 2014. When I was younger I always loved going to the cinemas and watching films. I always found myself wondering how they filmed movies. I loved watching the behind the scenes of my favourite films. I guess that always stuck with me. After high school I bought myself a video camera and started filming skateboarding with my mates. During this time I became more interested in camera work which lead me to film school, then eventually into the industry. using them professionally then. We work on a lot of outdoor adventure shows and the landscape over here in Australia really lends itself to aerial filming. The Kimberley is always stunning from the air. The Flinders Ranges is another great spot, Cape York has some stunning locations as well. The Gulf in the Northern Territory, the Victorian High Country – I could go on and on! We were always hiring choppers and spending big chunks of the budget on them so when drones became capable of capturing good quality video it was a no brainer to start using them on shoots. 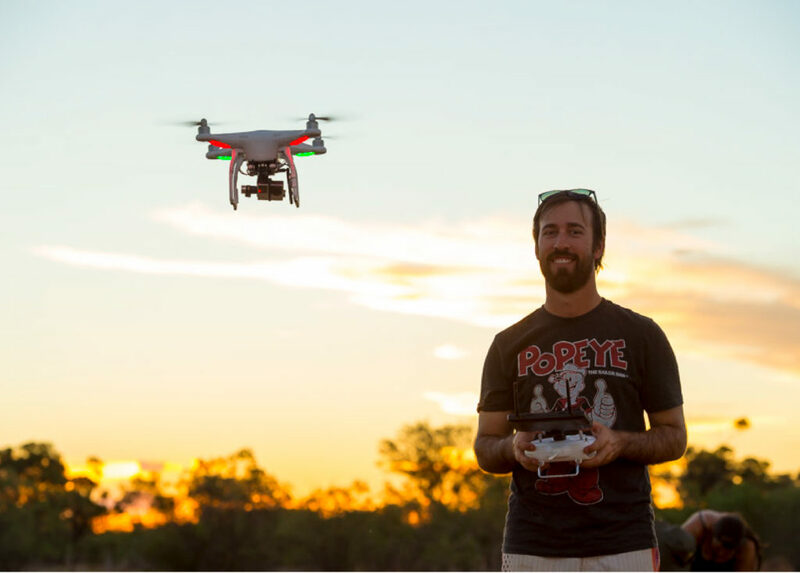 I’ve always flown the DJI Phantom range of drones, currently I am flying the DJI Phantom 4 Pro+. When I am working there are a few “can’t live without” items. My Sony F55 (I love that camera), Miller Compass tripod, Kessler Slider, CreamSource lights and ShotPut Pro. There’s plenty more gear in the kit but those would be my favorites. I first heard of ShotPut Pro years ago in forums. I heard people talking about this great piece of software that verifies your copied footage and I thought to myself I need to be using this. We travel to a lot of special places and only have one chance of capturing footage there a lot of the time. I want to be confident that the footage is properly offloaded and error free! I think that’s my favorite feature of ShotPut Pro, the verification. That’s what helps me sleep at night! Knowing that all of the days work is safely backed up. Copying to multiple drives at once is another awesome one and I am a fan of the ‘Source Integrity Verification’ option which can help detect things like damaged card readers or cables. I think the biggest tip I can give to beginners is to just keep filming. It’s a very competitive industry and cameras and editing equipment have become a lot more accessible. You really need to stand out. Film videos and get them up online. Share them around. They don’t have to be paid gigs, just anything that can showcase your talents. That’s what I did. I wrote letters and emails to lots of different production companies when I started out and didn’t get a response in most cases. Experiment, watch lots of films and documentaries. If you stick to it someone will notice you. Very proud of you Son, your achievements in life are outstanding, I know how hard you have worked to get to where you are today.